I adore Christmas lanterns, their soft glow cheers up the room on a darkened evening or they look lovely in a windowsill making your home look even more inviting as you get closer. 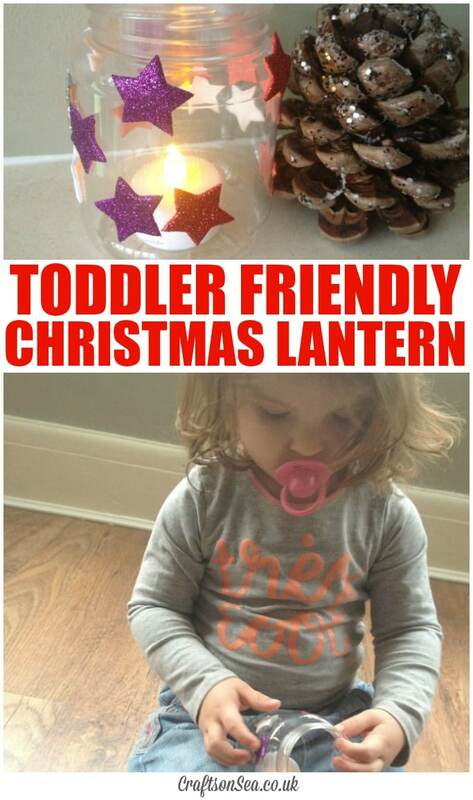 But a toddler friendly Christmas lantern? My four year old son and I made traditional glass lanterns last week and my toddler joined in but….oh man she just hates the feel of glue. Really hates that stuff, and you could tell she really wanted to craft with us and she gave it a good shot but it just wasn’t the greatest thing for her. We love making crafts for toddlers though so once we’d put away all the totally non-toddler friendly stuff I started thinking about how we could make this classic Christmas craft into something she could do too and this is what I came up with! A plastic jar that looks like a glass one. It’s got to not look out of place next to her big brother’s jar, right? The jar I used was from some Sainsburys value peanut butter which I think is 65p. If you don’t like peanut butter you can always use it to make bird feeders. Some festive stickers, go as festive as possible, we loved these glittery stars! Before you start make sure that all the labels and glue are removed from your jar. Peanut butter is actually pretty for this or I sometimes use a mixture of baking soda and olive oil if hot water alone won’t do the trick. Let your child have all the cute Christmas stickers you can find and let them go wild! For this craft layering and gaps really add to the end product so it’s a perfect craft for toddlers. Once you have finished just pop a LED tealight into your lantern. LED lights are perfect for this as you don’t have any kind of risk that you would have with a toddler and a traditional naked-flamed tealight. Using a LED light means they can now play with their Christmas lantern too. 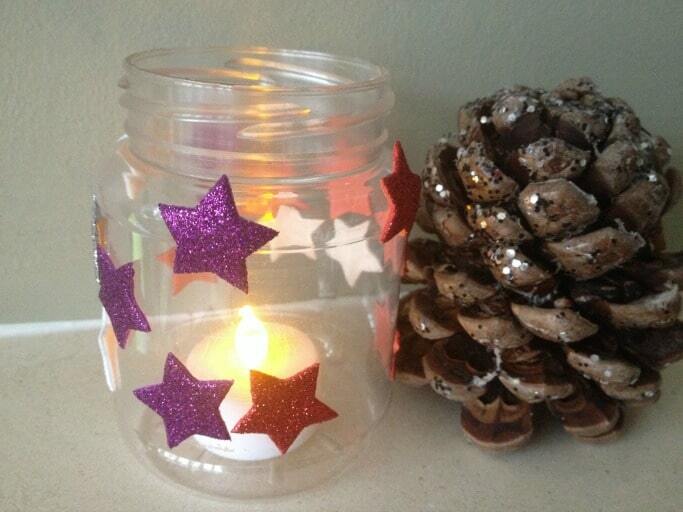 If you’ve got a few kids together making this craft maybe they could hold their own little Christmas light parade? !